the first weird thing that happened today was when i woke up. no, really, the emphasis is on when i woke up: eight a.m. yesterday, i went into manhattan to catch the taping of the daily show with jon stewart. and if i was OMGTVGIRL enough i would screencap where i am on that episode, put it on my blog, and put lots of exclamation points after it. i got home late that night, took a shower, and crashed on my bed. that is the exact and only order of events, and not only did i still wake up at eight this morning (really, let’s put this in perspective, ok? i only have so many weeks left until higher education reenters my life and pretends like it’s actually something important), i really got up. brushed my teeth and everything. what the hell? is this what growing up is? 1) there are so many freaking lizards in the pet store. ok, yeah, i knew there would be a lot of weird looking species in the world itself, but the pet store? you’re just making more work for me. do you really think i care if the lizard grows to 13 inches or 15 inches? my friend is probably going to kill it in a month. 2) they apparently need a lot of crap to survive, which is more work for me yet again because i have to find all this crap. but thankfully my friend and i are nearly always on the same wavelength and just opted for the $60 box that touted itself as a “desert lizard kit.” heck yeah, that’s what i’m talking about. 3) i have to get pet store guy to teach me the ways of the lizard owner, much to his dismay, since my friend and i came directly from the pool, where i was essentially half dressed and wet, and this just wasn’t the right look to convince him that the lizard and its cage would be completely ok hiding under my friend’s dorm bed at university. 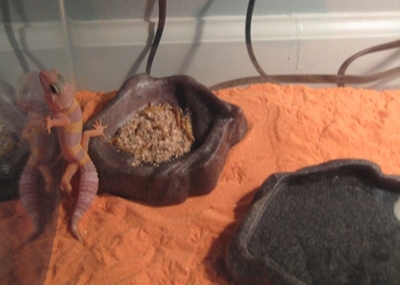 i think i won pet store guy over when i asked for an alternative to the lizard’s diet of live crickets and meal worms. he gave one of those looks. evidently, there is no such alternative, but really, in my heart of hearts, i think those things can probably live on fish food or something. crickets and worms are probably for the upper level lizards. i think his name is muchacho.